I ran the Applefest Half Marathon yesterday in Hollis, NH. It started at 10 AM which was nice because it didn't require me to wake up in the middle of the night to get there. It was an hour away so I left the house at 7:30 and had plenty of time to get there, get my number and wait for a while before the start of the race. The half marathon is now in its 26th year and attracts between 900 and 1,000 individual runners. While that's a decent amount of people, it was quite manageable as they blocked off half of the street for the runners. I was behind people in the first mile, but after that, it thinned out and you could really run at your own pace. They put limits on the number of entrants and apparently it sells out early. I'll separate this report into 3 sections: Interesting Things/People, My issue with the headphone ban and finally my running of the race. While I was waiting to get started, I met a great guy named Fred. He was 70 but didn't look a day over 55. He retired at 55 and traveled the world going to great marathons. He ran the first marathon after the Berlin Wall fell where they ran across from East Germany to West Germany. 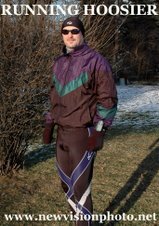 He also did the first marathon of the millenium in New Zealand on January 1, 2000. I mentioned that he probably had a lot of t-shirts from all of these runs. He chuckled and said at last count he had 880! That's unreal. What a neat man. DLF >> DNF > DNS. In other words: Dead Last Finisher is better than Did Not Finish is better than Did Not Start. What a great way to look at it for those of you doing something for the first time. The mere fact that you're getting out to do something is so much better than having never gotten off of your couch. "Applefest does not consider this a game of wits, stealth or technology changes. If any device is capable; 1) of playing music, 2) of acquiring the ability to play music, 3) of being a continuous distraction to the user, then it is disallowed." Wow. They also say that "mere POSSESSION of disallowed items on the race course will be considered a violation and the runner will be disqualified." So if they even see an iPod on you, even if you're not using it, then you're disqualified. They also said they'd pull you off the course. This is beyond ridiculous and a big reason that I won't be doing this race again next year. While I didn't wear my headphones, I thought it was a ridiculous and insulting way to go about enforcement of the rule. In fact, why even enforce the rule? Tell people they can't have them and if they break it, it's on them. At least the Portland Marathon got it right by being music friendly. Now that I stepped off my soapbox, on to the race. It was a fairly nice course with some rolling hills and nice declines through the woods. The temperatures went from 53 to about 60 degrees by the end, which was perfect. I had some stomach aches earlier in the race but my left knee and lower back were feeling fine and I was keeping a pretty good pace, sometimes as quick as 8:05 a mile. I was really feeling great through 8 and felt like I could run forever. Then came mile 9 and 10. There's a 200 foot rise in elevation over a set of hills (elevation profile below) and that was just killer. We rose for almost 2 miles near the end of the race and a lot of people dropped off. I was determined to at least keep running, no matter how slow. I did it, but by the time I got to 11, I was quite tired. Ironically enough, there was a cemetary at the end of the hills. That gave me a quick chuckle. 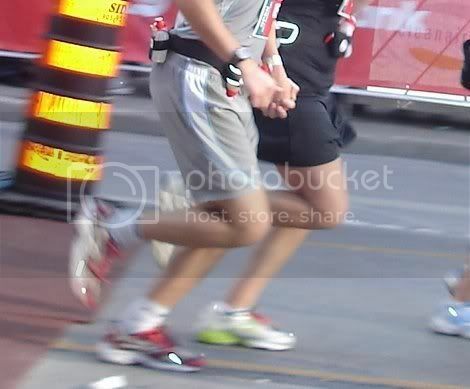 I finished the half-marathon in 1:54:58 which is within 30 seconds of when I've finished almost every half-marathon. I don't know what it is, but my body doesn't want me to move any faster or slower, no matter how hilly the darn thing is. I ran almost exactly the same on the first half (about 57:15) as I did on the back, so at least I was consistent there. Though I'm not concerned with the times much anymore, I did want to at least stay until 2 hours, which I did handily. When I got in, I was treated to apple crisp and bagels (with apple butter as the glue). That and some sports drinks made for a nice ending. So the numbers for the race... I came in 367/908 and 32/49 in my division (20-29). Without looking at the relay teams, the individual runners ran a combined 11,894.8 miles which is the distance from New York to LA out and back twice and a quarter of the way there again. That's impressive. 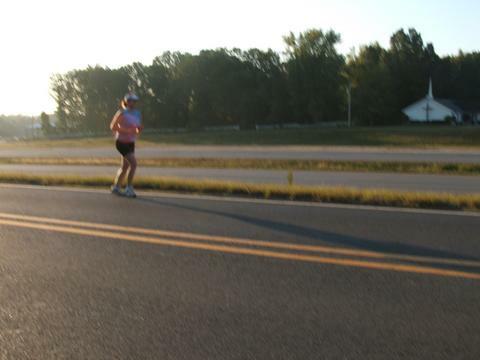 Next for me is the 48 Miles in 48 Hours event on the 18th/19th and the Seacoast Half-Marathon on November 9. God job and respectable time. I don't relish the idea of running a race and everyone being in their own music zone and missing the camaraderie between runners but I don't think there will ever be that many runners listening to music and also - I guess if that's what people want to do, that's what they want to do? Love the snacks at the end - yum! Congrats! And dang what a hilly course! Sounds like a nice event - too bad about the music rule! Congratulations on making it through...that chart looks brutal. Very respectable time! Having spent a week in NH, I believe there is not a flat half marathon course to be found in all of the state. Nice job on your race!! And best of luck to you on your 48 in 48! Looking up the definition of, "Draconian..."
But really, Greg? Thanks! Tomorrow as I attempt to pass through the TSA security area, I may have something different to say, but for right now? Thanks! I am also running the Seacoast Half next week, and was wondering how strongly they are going to be acting on banning headphones. They say they will be enforcing it on their web page, but I've heard that stuff before and then seen everyone else wearing them. Personally I love my music, and I am alert to what is going on around me, so it kind of makes me angry when people say that only those with headphones get in other people's way. I have been cut off many times by runners without headphones, who realize all of a sudden that there is a water stop across the street. i did look at some pics of the Seacoast race from last year and there are clearly some people wearing iPods! But anyway, good luck next week! What's insulting is runners that sign a waiver (give their word) that they won't break the rule) then break the rule. Or they insult the RD's intelligence by saying "Oh, my music player is not an IPOD, it's an XYZ brand." or "I didn't use it, I just wear it like jewellry.." Sure you just wore it and didn't use it. Whey YOU set the rules, then you get a say in what they will be and how they will be inforced, otherwise your comments are meer noise and have no force. If headphone users act like imature children in how they act and the games they attempt to play, then the rules and explanation of those rules have be spelled out in insulting language the conveys that the other side already has thought about the BS stories and word twisting attempts at avoidance. I'm sure when you're given no room to move it does bother some folks. To the management it's not a subject that is at a "game" level.